American Custom Lifts is proud to carry Backyard Buddy products. Backyard Buddy 4-post lifts provide a perfect track record of Quality and Safety. Backyard Buddy is proudly made in Warren, Ohio. American Custom Lifts sells throughout the world with service centers in most major cities throughout North America. We only use U.S. or Canadian structural grade steel. Even the electric power unit and hydraulics are American made. Our lifts are an extremely safe and stable design. Our new automatic back-up lock is an added bonus in case of slack in the cable (which has never happened). Backyard Buddy Lifts are truly free-standing. They do not need to be bolted to the floor. Backyard Buddy is easy to roll around the shop even with a car on it. Our large phenolic casters will not mar your floor like some other lifts’ steel casters. We only sell factory direct and through our trusted distributors. We offer honest freight charges that are not added to the price of the lift. Some companies offer a delivered price, that just means you’re paying the same freight costs whether you live in California or Indiana. We show your freight charges up front, and the maximum savings available by shipping from point to point. If you live nearby and have a regular car trailer, you are welcome to pick up your lift at our factory. You just need something like an engine hoist and some friends at home to unload it. Even the smallest of details have been taken care of with you in mind, right down to the way we package your lift for shipping. We use steel end crates to keep everything together, so off-loading is easier whether you use your own trailer at a local dock or have our freight company bling it to your door. Your lift arrives as ready-to-bolt together factory assembled sub-assemblies. With a little help and common hand tools, you should be up and running in less than a day. Check out some assembly photos to see Sam Memmolo of Two Guys Garage fame assemble a Backyard Buddy lift in his home garage. 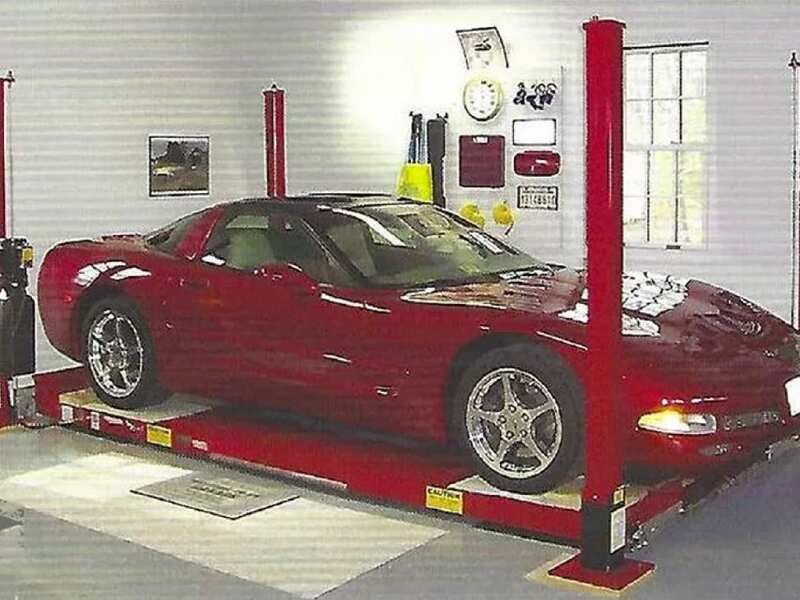 This 7,000 LB Series top of the line lift for the home collector is powered by an 110V (or 220V) power supply and is perfect for your home garage or workshop. An optional sliding jack platform accommodates a bottle jack, allowing you to remove the wheels and brakes for service. Add even more versatility with our built-in rolling hydraulic platform jack that runs on the same hydraulic power supply as the lift. 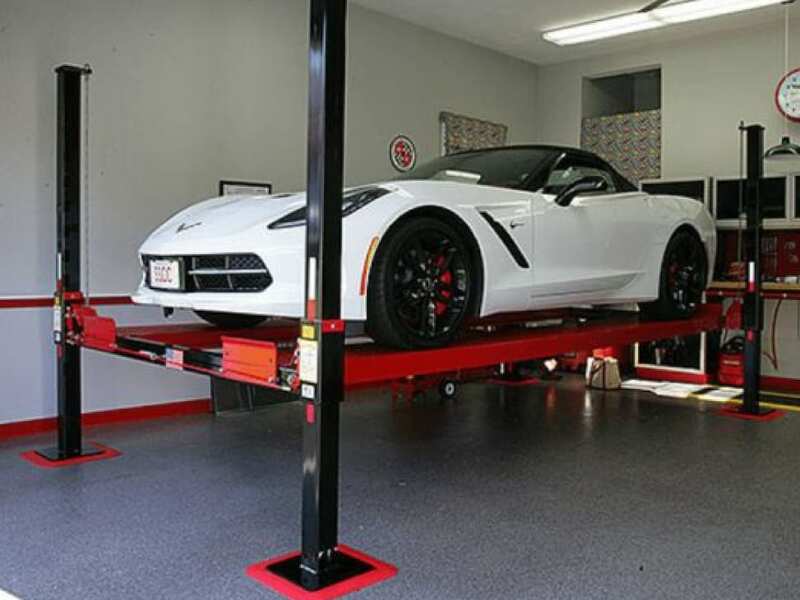 With 63″ of clearance under the platform, the Collector lift offers plenty of room to work under your favorite cars. It also has enough clearance to accommodate almost any car under the platform for extra storage. The Service version of the 7000 LB Series has an additional 8-1/2 inches clearance under the deck (71-5″) and is 12 inches longer. This lift is also powered by an 110V power supply (also available in the 220V) and accepts all of the same accessories. This unit offers a full six feet of clearance under the platform. The construction and design are the same as the collector lift but with extra clearance to accommodate taller vehicles. This lift is great for anyone with an extra tall ceiling. 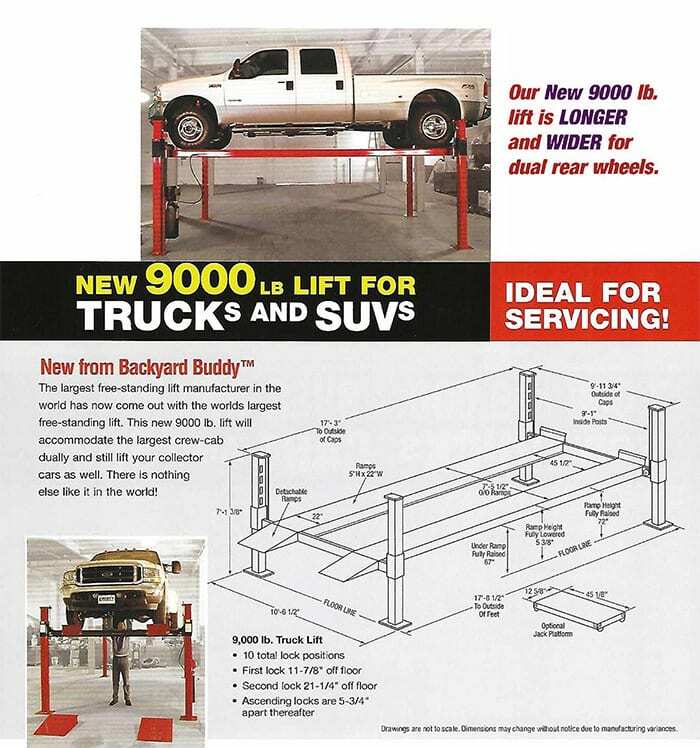 Backyard Buddy also offers a special 7,000 LB Series Workforce lift with an extra tall 84″ underneath the deck. It’s over a foot wider for extra stability, almost four feet longer and will handle most trucks and large SUVs. This special application lift accepts all of the standard Backyard Buddy accessories. With a full 7 feet of platform clearance, this lift is perfect for shelving storage applications. You must have extra ceiling clearance for this lift. This 9,000 LB Super Duty Lift has 17 inches more headroom under the ramps than the Rugged Lift. The deck is almost a foot wider than our Collector 7000 LB model to accommodate trucks with dual rear wheels. At almost 4 feet longer and with an inch thicker deck, it’s plenty “Super Duty” enough for dually crew cabs and the biggest SUVs. This lift is powered by 110V power supply or optional 220V for faster lifting. The construction and design are almost the same as the Collector Lift with the exception of heavier steel and the thicker decks. 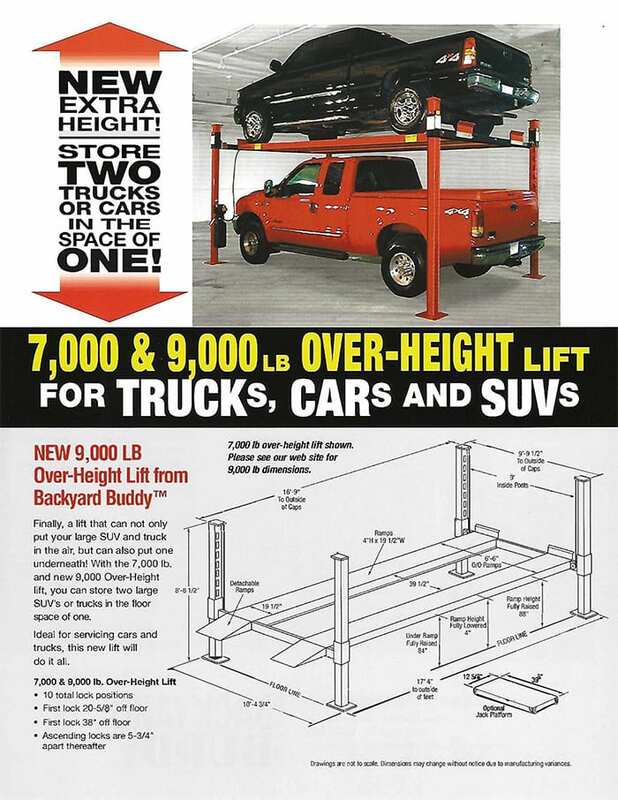 The newest addition to Backyard Buddy’s line of lifts is specially designed to store a boat trailer over another vehicle or other equipment in your garage. This gets your boat out of the weather and lets you park a car, snowmobiles, motorcycles or lawn equipment underneath. It’s extra wide to fit most 102″ wide boat trailers and includes an adjustable stand that supports the trailer tongue. It’s here! The 3000 lb. Rec Lift by Backyard Buddy is ideal for the person with a lot of toys in their garage. It will raise 44″ to the top of the runways with 40″ of clearance underneath to give you the perfect height for maintenance, cleaning and anything else that your toy requires, including winter storage. With 10′ long runways and 70″ between the posts, your motorcycles, trike, mower, snowmobile, golf cart and ATV will fit with perfectly. It comes complete with a solid deck to help with your maintenance needs.